I talk to AJ Brooks more than anyone else in SL, with Viv Trafalgar running a close second. 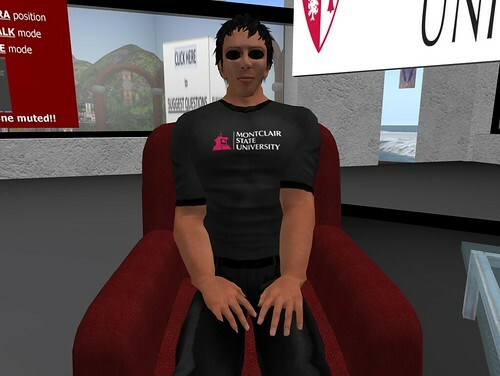 Yet while Viv and I often prognosticate about the future of virtual worlds, AJ is usually engaged in moderating the weekly Virtual Worlds Education Roundtable, so our chats tend to be on the topic of that day. Using as my point of departure AJ's article "Virtual Worlds? Outlook Good," from the September/October 2008 issue of EDUCAUSE Review, I asked AJ to visit my office on Richmond Island and revisit his topic. A great deal has occurred since then. When I asked AJ what had changed the most since he published the article, he noted that "the virtual world gird is beginning to become more distributed." For Linden Lab, AJ is not optimistic about the future of their virutal world. "I think SL's future is in their own hands right now," he said. "They can continue to be an island unto them selves, and miss out on being part of a larger grid effort - truly putting them into the 'AOL' type position I've been talking about for a while now....OR they can work with those pioneers who are designing the true metaverse, one that is not proprietary. My guess is that they will NOT do the latter." While Brooks is "cautiously hopeful" about the return of Philip Rosedale to the CEO's chair, "I think this ship is headed in a direction, and Rosedale is probably not inclined to change that direction." Brooks detects a gradual departure of educators leaving SL for OpenSim-based worlds, since "educators are pioneers, and they've seen their community attacked over and over again." AJ's answer to my question about one thing he'd change in SL, if he could: "I'd build in a creative commons type permissions structure so we would not have this issue with content creations and ownership issues (or at least not as dire)." That's my #1 wish as well, since it would free up content for out-of-world backups, something I'll easily be able to do in OpenSim. The entire text of our interview can be found here.